Despite the fact that women have historically been excluded from many economic opportunities, they have always found new and resourceful ways to contribute. Now, a greater number of women than ever before are participating in the economy, and the result is beneficial to woman-kind and society as a whole. Cheryl Braganza's vivid painting depicts the optimism and excitement of women earning new respect and assisting each other at the grassroots level to work towards an economically robust and sustainable future. Women have traditionally been confined to roles related to their biology--mother or wife, child-rearer or home-maker. Despite this narrow slant on their social worth, women are increasingly coming together to assert themselves as viable generators and distributors of economic wealth. The Harvest is a metaphor for women's economic prosperity and the richness that comes with being a woman. 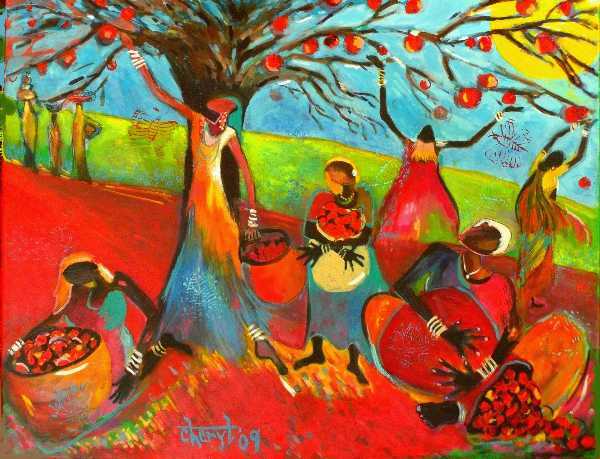 The apple orchard represents the world, the fruit are women's myriad talents which are picked at appropriate moments, then distributed for the greater good of the economy, society and humanity. The spreading branches of the trees represent networks of opportunities that women are making available to themselves. The abundance of fruit is symbolic of the benefits women reap when they assert themselves in new ways. The women are of various ethnic origins as exemplified in their dress and the color of their skin. We know that when we enfranchise a woman in one country, we help to enfranchise women all over the world. The painting is also meant to represent the growing grassroots movement among women: if we adopt female-centered approaches to economic growth and social justice, including making an effort to not only accumulate but redistribute wealth and resources more equally, then we as a society are making great strides towards a sustainable future.